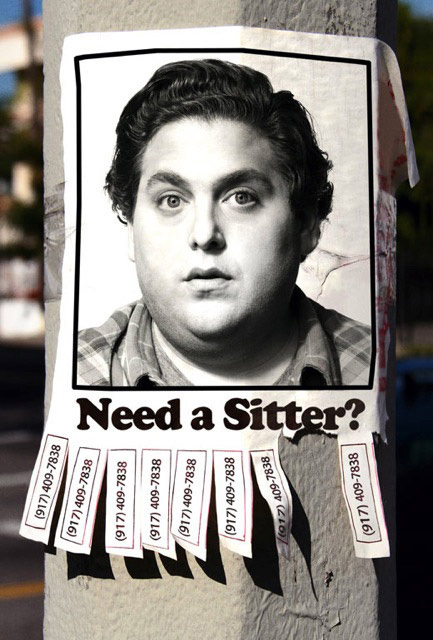 If the hilarious red band trailer for The Sitter wasn't enough to convince you that Jonah Hill is probably the most competent and responsible babysitter to hire in this day and age. Maybe you can let the guy speak for himself. In a form of viral marketing for the R-rated comedy from Pineapple Express director David Gordon Green, a picture of one of those paper-tab classified ads you see on street poles and college bulletin boards has appeared (via ComingSoon) complete with a real phone number to call. Apparently Hill himself will actually be answering the phone at random, so feel free to give him a call! Get the number below! The Sitter is directed by filmmaker David Gordon Green, of all kinds of films including George Washington, All the Real Girls, Snow Angels, Pineapple Express and Your Highness previously, plus work on "Eastbound & Down". The screenplay was co-written by Brian Gatewood & Alessandro Tanaka (Saturday Night, 5G). 20th Century Fox is bringing The Sitter to theaters everywhere on December 9th this winter. I'm so there! Number says disconnected so either this part of the viral campaign is over or it is randomly connected. It sounded like the real "Number disconnected" message and not a spoof that is used for virals. Sorry, dialed the # wrong. It is a voicemail which is pretty hilarious...any bikini photos? I initially didn't care for the guy, but he's grown on me. This looks like a fun little flick, but I am hoping that it is the last of the "fat" Jonah movies. I think this and Moneyball are the last of the Fat Hill movies. Jonah Hill... I really can't stand that unit. His personality is quite annoying and typical.